With soaring harmonies, gorgeous song compositions and mentoring from Beyoncé, the teen sisters are one of music's most promising new acts. 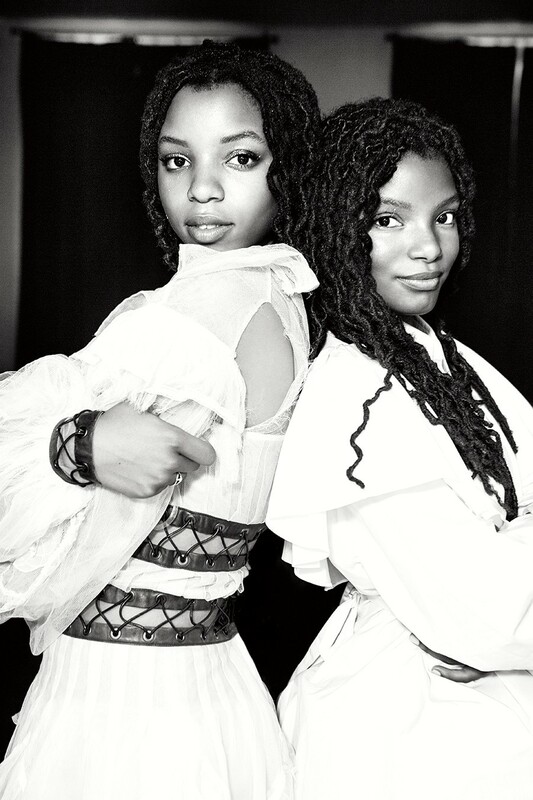 In 2011, Chloe and Halle Bailey made their TV debut on The Ellen DeGeneres Show, performing a cover of Beyoncé's "Best Thing I Never Had." They already had a very popular YouTube channel and several million video views to their names but it would be two years later and another Beyoncé cover -- an earth- shattering rendition of "Pretty Hurts" that they posted online -- that their lives would change. "Two weeks after we posted the 'Pretty Hurts' video, we got an email from Beyoncé's entertainment company, Parkwood," Chloe recalls, setting the scene. "They were like, 'We really love this -- can we post it on all of Beyoncé's socials? ...And are you guys signed?'" 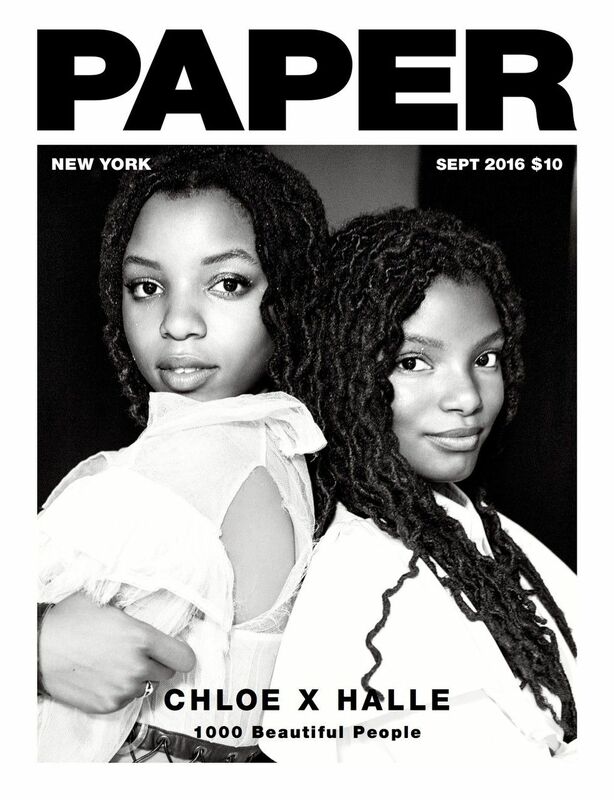 Six days after Lemonade came out, the two -- now stylizing their names as Chloe x Halle -- released their Sugar Symphony EP, which went on to receive critical acclaim from Billboard, Rolling Stone, and countless others. Chloe, who just turned 18 (Halle is now 16), produced the lead single,"Drop," in the sisters' home studio in L.A., where they recently relocated from Atlanta. They had another major relocation (or, rather, multiple relocations) for work this summer -- the two traveled throughout Europe and opened for their famous mentor on Beyoncé's Formation World Tour. 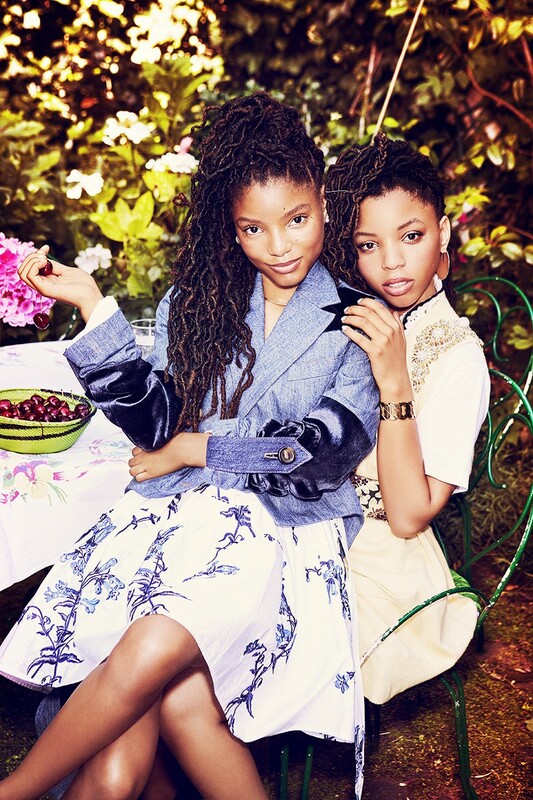 Chloe and Halle's success seems to have come naturally. Their ability to harmonize with one another appears intrinsic, and they're exceptionally poised, displaying the kind of maturity one expects from young talent that grows up with camera training -- and these girls did. (When she was just 3 years old, Chloe played a toddler version of Beyoncé's character in 2003's The Fighting Temptations -- a grand coincidence lost on no one.) "We always loved being in front of the camera, even as little girls,"Halle recalls. "That was a fun way for us to learn how to express ourselves and navigate our emotions." The sisters grew up auditioning for acting roles, getting small gigs here and there, but eventually, music became their main focus. They started a YouTube channel in 2006 and by 2011 were posting videos of themselves singing covers. But now, with Sugar Symphony, the sisters have the opportunity to release original music and create their own sound, which, as heard on the EP, favors dark and moody beats mixed with lush gospel harmonies, a rare, ethereal combination that has an enduring, modern appeal. During the recording process, Chloe recalls that they were going in this "dark and vibe-y" direction "without even knowing it," buoyed by a positive response to "Drop" from the Grammy Award-winning writers and producers they were working with.They teamed up with Hit-Boy, who's worked with Beyoncé, Jay Z and Kanye, to co-write "Red Lights," another track from Sugar Symphony that, like "Drop," initially sounds delicate but wouldn't feel out of place bumping from a subwoofer. Chloe wears a dress by Chanel and earrings by Saskia Diez. Halle wears a shirt by Kenzo, tutu by Repetto and necklace and earrings by Saskia Diez. Halle wears a jacket, dress and shoes by Miu Miu and necklace and earrings by Saskia Diez. Chloe wears a t-shirt, vest, shorts, belt and shoes by Miu Miu and a bracelet and earrings by Saskia Diez. As excited as they are by these opportunities to work and collaborate with major artists and producers, the sisters say they've learned from Beyoncé to believe in the music they create -- just the two of them. "It's an incredible feeling, because yes, we do believe in ourselves, but hearing that from Beyoncé makes us believe in ourselves even more," Chloe says. While Beyoncé may be the latest mentor in their lives reminding them to believe in themselves and to keep control over their work, it's a message they've been hearing for much longer from their parents, Doug and Courtney. "Our dad is a great writer, and one day he sat us down and said, 'Girls... you'll have the most power if you write your own stuff,'" Chloe recalls,"so we researched proper song structure together. He taught us about metaphors, similes and alliteration when we were sitting at our dining room table writing our first songs." But as much as they're venturing out with their own music, they still know how to nail a good cover. In late July, the sisters posted their version of one of Chloe's favorites: "Timmy Turner," the newest song from rapper Desiigner. The cover, a beautiful two-part harmony that wouldn't feel out of place on Destiny's Child's The Writing's on the Wall, was a hit with their followers and even inspired response videos from fans. "I love watching people upload videos of themselves dancing to the cover like it's a full-on trap song," Chloe enthuses. It's these connections with fans and the chance to build a community on the Internet that motivates the sisters to continue uploading covers of other artists' music (like Rihanna, Lorde and Lil Wayne, to name a few), even as they travel the world with Beyoncé. "Social media has really made us feel like we're connecting, so we try to keep that link with our fans, because without them we wouldn't be where we are now," Chloe says. "The Internet is super important to us," Halle adds. The Bailey sisters are as gracious as they are skilled, but this is not an exaggeration: "We taught ourselves how to play our instruments off of YouTube videos," Halle continues. "Chloe even taught herself how to produce fromYouTube -- so YouTube has obviously been good to us!" The Formation Tour audience has been good to them as well, building hype for their as yet untitled debut album, which is set to arrive later this year. "Connecting with people who aren't familiar with our music and knowing that there are so many eyes looking at us is just so strange," Chloe says. "But," she adds, "the most important thing is to believe in yourself." Beyoncé would be proud.